Two separate new collections have been added to eSearch – House of Commons Parliamentary Papers (HCPP) – 18th Century and House of Commons Parliamentary Papers (HCPP) – 20th Century. These join LLR’s existing subscription to House of Commons Parliamentary Papers (HCPP) – 19th Century. All three collections are delivered through a single unified Proquest interface. Each collection offers “page facsimiles, searchable full text and a detailed subject catalogue of House of Commons sessional papers and supplementary material” for the period in question. Access to all three collections is direct on-campus, and by university username and password from off-campus (using the Shibboleth framework). A guide to using Shibboleth to access these collections has been added to the eServices support wiki. Posted in eSearch, House of Commons, Shibboleth on January 20 2009 by Resource Discovery and Innovation Team Manager. An updated eBrary interface is due to go live for all existing customers in the next 24-hours (see a sample illustration below). eServices will be testing all aspects of the new interface as soon as is it live for LLR’s subscription, and IR will review the existing local eBrary documentation, updating it as necessary. As well as design and presentational changes, probably the most significant change is the introduction of a default QuickView display for each eBook in the collection. Essentially, QuickView offers a read-but-don’t-touch view of the full-text content – and does not require the eBrary web browser plug-in. However, QuickView does not offer the full interactive functionality that the plug-in offers (such as such as printing, adding notes, or adding highlights). When viewing content in QuickView, a display offers the customer the option to launch the eBrary Reader plug-in – for copying, printing, notes, highlighting and InfoTools (see illustration below). If a customer clicks on that eBrary Reader button, the plug-in will launch and all of that functionality will become available. 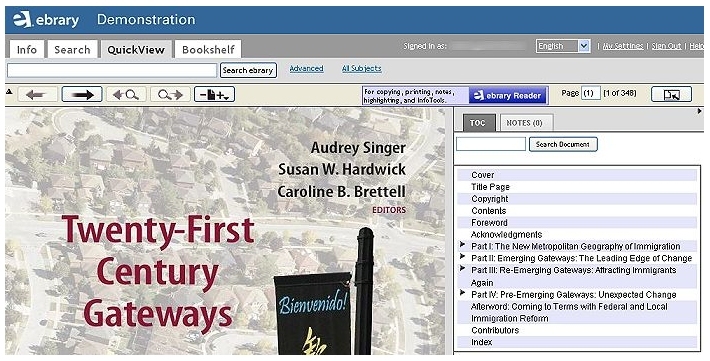 If, in QuickView, a customer clicks anywhere on the page of an eBook (in an attempt to highlight text, for example), a pop-up window will launch, informing them of the need to launch the eBrary Reader (see illustration below). Once the eBrary Reader is clicked, the plug-in will load in a new window along with an interactive version of the eBook content. eBrary’s intention in making this change is to remove the need to activate the browser plug-in if all the visitor wants is to search, browse and read the eBook text. Posted in eBrary on January 20 2009 by Resource Discovery and Innovation Team Manager. A searchable database of marketing and media intelligence. The data is collated in association with a wide range of respected industry research bodies, including: Audit Bureau of Circulations, Barb, Cinema Advertising Association, Institute of Practitioners in Advertising, National Readership Survey, Nielsen Media Research, Office for National Statistics, Outdoor Advertising Association, Postar, Rajar and WARC. Up to eight members of Nottingham Trent University can access this resource at the same time. If you see a message indicating that all of NTU’s licences for BRAD are in use, please try again later. Posted in eResources, eSearch on January 20 2009 by Resource Discovery and Innovation Team Manager. NTU’s online learning environment NOW is now making use of Shibboleth for staff and student login. This means that if a member of the university logs in to NOW and then (using the eSearch search widget) accesses a database in eSearch which requires Shibboleth authentication for access, they should be automatically authenticated without needing to log in for a second time. This is an important development on the path towards the goal of a ‘single sign-on’ environment for NTU staff and students. Posted in NOW, Shibboleth on January 20 2009 by Resource Discovery and Innovation Team Manager. A technical problem which was affecting remote and metasearching of Emerald in eSearch earlier this week has now been fixed. Emerald searches are now returning results in eSearch normally. Posted in Emerald, eSearch on January 20 2009 by Resource Discovery and Innovation Team Manager. Access to the isurv service in eSearch, which had been temporarily unavailable, has now been re-enabled. Access remains direct on-campus, and by university username and password from off-campus (using Shibboleth/eZproxy). As the nature of NTU’s subscription to the service has changed, the message which displays to a logged in NTU staff member or student has changed to the following: “Hello, RICS East region universities – you are signed in” (see illustration below). This message previously referred to ‘Nottingham Trent University’). This change has been necessitated now that NTU’s subscription costs to the service are being met directly by RICS (as part of a wider agreement with other universities) and that LLR’s previous paid-for subscription has been suspended. Posted in ISURV on January 20 2009 by Resource Discovery and Innovation Team Manager. An enhancement to the way in which the SFX (Find it @ NTU) service checks the library catalogue for print journal holdings has now gone live. Previously, when SFX found a matching ISSN in the library catalogue, a link to the catalogue record was offered in the SFX menu. Now, SFX is able to pull back from ALEPH the ‘summary holdings’ statement in the catalogue record and display that information in the SFX menu alongside the link (see illustrations below). Feedback on this new functionality is welcomed, and can be shared with ALT members of the ‘SFX and eSearch Development Group’ Jon Fletcher and Rachel Campbell. Posted in Library Catalogue, Library OPAC, SFX on January 20 2009 by Resource Discovery and Innovation Team Manager.